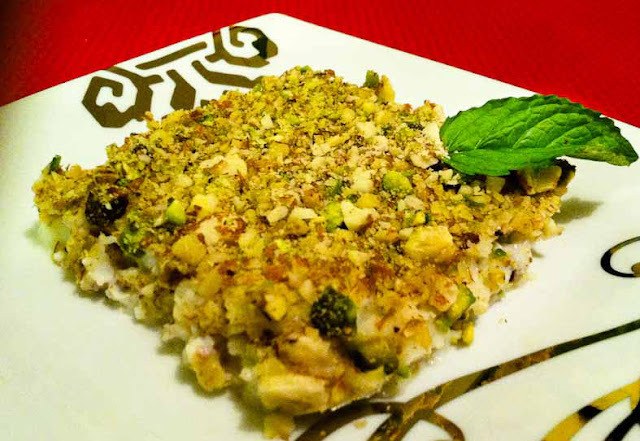 Kishk el Foukara is a Lebanese dessert that is extremely easy to prepare yet very rich in taste. The exact English translation of “Kishk el Foukara” is “Kiosk of the Poor,” an interestingly strange name indeed. It is also known in other areas of Lebanon as “Muha-lla-biyyeh”. It is absolutely delicious and a childhood favorite. The ingredient with the most subtle effect on taste is the orange blossom flower water, so this is an absolute must-have to get the original recipe right. Mince the walnuts, almonds and pistachio in a food processor for 15-20 seconds. You may want to mince the almonds separately since they’re harder. Alternatively you could also buy cracked/minced nuts but we prefer to mince them ourselves to get a stronger flavor. Mix the milk, sugar and corn starch in a bowl very well until all the starch has melted away. Bring the mix to a near boil on medium to low heat all while stirring continuously. When the pudding nears boiling and starts to thicken, add 2 table spoons of orange blossom flower water and stir for 3 more minutes. While the mix is still very hot pour half of it in your 2-inch deep serving tray (Pyrex glass), sprinkle half of the minced nuts on top then add the remaining pudding as another layer and finish by sprinkling the remaining nuts on top. You should have 2 layers of pudding and 2 layers of nuts. Let the tray rest for 30 minutes, then refrigerate for 1 hour prior to serving. A tray similar to the one in the photo above should yield about 8 pieces scooped with a spatula. PS. For those who have nuts allergies, you may serve the milk pudding topped with raisins and mint.